It’s summer right now in my little corner of the world, and there is nothing that I like better than to go out in the sun and wind and fly a kite. However, if I wanted to, I could just stay inside, watch TV, and fly the Silverlit Kazoo indoor kite. I know what you are thinking the moment you saw the title: an indoor kite? What are you, nuts? Is this designed for people who have a wind-tunnel in their living room? Actually, the Silverlit Kazoo comes with an electric motor that is able to keep it aloft in the absence of wind. Now, you could say that the Silverlit is not a kite per se because of the aforementioned electric motor, and I would agree. The motor is tethered to a remote control that requires 8 AA batteries in order to function. I am guessing that the remote just has a button to control the speed of the propeller motor, and nothing to control the direction or height of this “kite”. 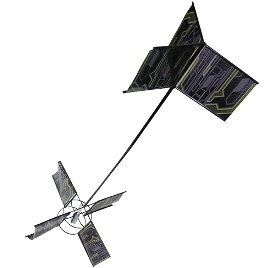 However, the product is billed as the “Silverlit Kazoo Electronic Remote Control Indoor Flying Kite”, so if you want to check it out for yourself, go over to the HobbyTron site and order it. It only costs $14.95.